Description: Coming into the sunrise at 6:53 AM. Description: CSX 7101 gets pulled by a BNSF Dash 9-44CW Orange Unit through Joliet Union Station. Description: Southbound stack with a nice lashup sits at the CC boards. Description: CSX local shoves cars back in to the storage track in Aberdeen. The power to the right is an empty ACWR grain train with CSX run-through power. Description: Here's something you don't see a lot, a B36-7 leading 2 widecabs. Description: CSX train Q237 brings more automobiles to clog the highways of the Tampa Bay area, shown here just south of Coleman on the S-line. Description: A trio of GE's lead westbound mixed freight Q389 past Viaduct Jct. and heads towards Sandpatch grade. 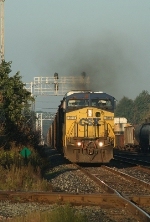 Description: CSX C40-8W 7811 leads Q57430 (Nashville Tn. to Cincinnati Oh.) through Gaithers.